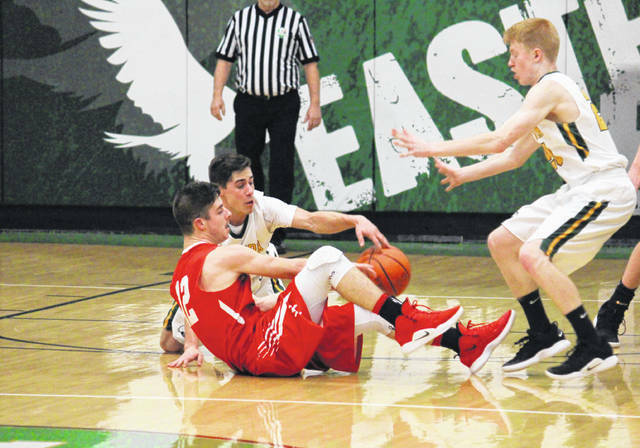 Eastern senior Sharp Facemyer steals the ball in front of teammate Ryan Dill (right) and Wahama junior Abram Pauley (12), during the Eagles’ 37-36 victory on Tuesday in Tuppers Plains, Ohio. Wahama senior Jonathan Frye (14) tries a two-pointer over Eastern’s Ryan Dill (20), during the White Falcons’ one-point loss on Tuesday in Tuppers Plains, Ohio. TUPPERS PLAINS, Ohio — Ultimately, the Eagles finished what they started. 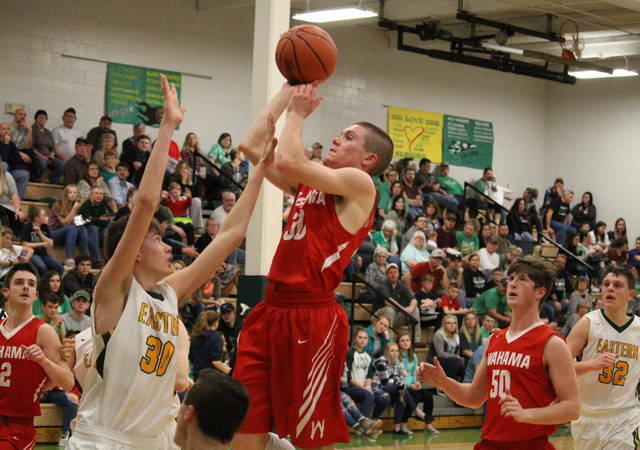 The Eastern boys basketball team scored the first 18 points of Tuesday’s Tri-Valley Conference Hocking Division bout at ‘The Nest’, but visiting Wahama claimed the next 20 markers. After three more lead changes, the final of which came with 12 seconds to play, the Eagles corralled the rebound on a missed free throw with less than a second remaining to seal the 37-36 victory. Eastern (11-8, 8-5 TVC Hocking) — coming off back-to-back losses — forced seven turnovers and sank seven field goals on its way to a 14-0 lead by the end of the first quarter. EHS hit two more field goals in the opening 55 seconds of the second period and led 18-0, but didn’t score again for the nine minutes. 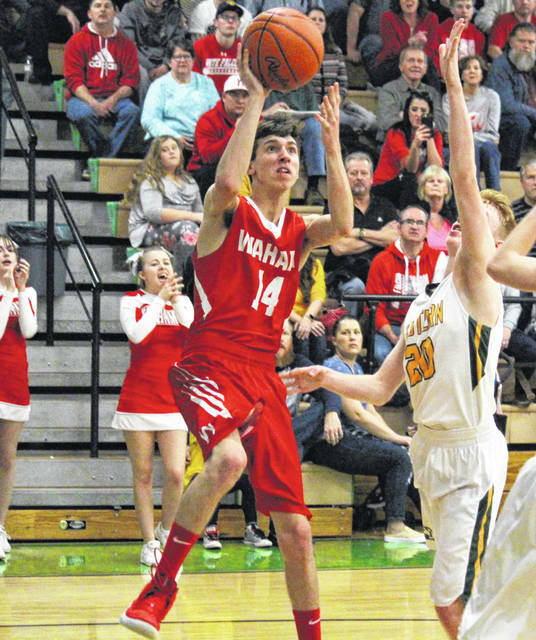 Wahama (2-17, 2-12) ended its own nine-minute drought with a free throw at the 6:43 mark of the second quarter. After missing their first 12 field goal attempts in the game, the White Falcons sank six of their next nine and trimmed the Eagle lead to 18-15 by halftime. The Red and White tied the game with a trifecta in the opening minute of the second half, and then took their first lead of the game, at 20-18, with 6:25 left in the third. Eastern broke the cold spell and tied the game at 20, before a 6-to-2 White Falcon run. EHS scored the last four points in the third quarter, tying the game at 26. Eastern then scored the first four points of the fourth period, but Wahama claimed the next four and tied it at 30. The guests tied the game again at 32 and 34 before finally regaining the edge at 36-34 with an Abram Pauley two-pointer with 1:03 remaining. A free throw by Colton Reynolds trimmed the Wahama lead to one point with 27 seconds left, and 13 seconds later, EHS junior Garrett Barringer made back-to-back free throws to give the Eagles a 37-36 lead. The White Falcons’ game-winning field goal attempt was knocked out of bounds with 2.3 seconds to go, but the guests kept possession. Wahama went 0-of-2 at the free throw line with .7 seconds left, and Barringer hauled in the rebound to seal the Eagles’ 37-36 win. Following the triumph, EHS head coach David Kight talked about the turning point in the game, and was commended his team for doing what it took to pull out the win. “We came out really well, came out on fire,” Kight said. “Wahama didn’t quit, and we knew they weren’t going to quit, they’re well-coached, they have some kids who can do some good things, they have a pretty good combination of size and skill. The turning point that allowed them back in the game was when we quit boxing out and started allowing them second chances. White Falcons head coach Ron Bradley acknowledged the slow start, but was pleased with his team’s effort to fight back and have a chance to win. “We were just struggling to get the ball in the basket,” Bradley said. “We got some pretty good shots, missed a lot of layups and wide open looks early, we couldn’t get anything to fall. Then, some shots started the fall, we kept playing defense and rebounding, and we started chipping away. For the game, Eastern shot 16-of-49 (32.7 percent) from the field, missing all-7 three-point tries, while Wahama was 15-of-39 (38.5 percent) from the field, including 2-of-7 (28.6 percent) from beyond the arc. 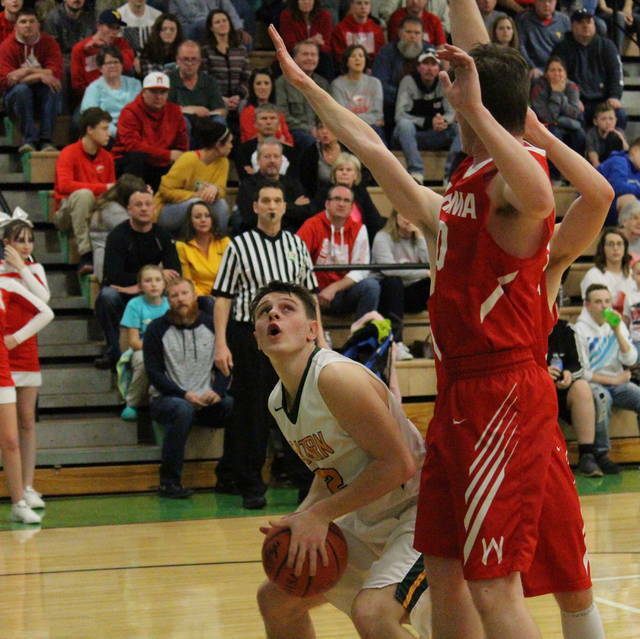 At the free throw line, EHS was 5-of-11 (45.5 percent) and WHS was 4-of-7 (57.1 percent). Both teams finished with 30 rebounds, with the Eagles claiming a 17-to-13 edge in offensive boards. The hosts collected 11 assists, seven steals and one blocked shot, while Wahama ended with nine assists, eight steals and four rejections. Barringer led the the victors with a double-double of 17 points and 12 rebounds. Isaiah Fish and Colton Reynolds had eight points apiece, while Mason Dishong scored four. Blaise Facemyer had a team-high three assists for the hosts, Reynolds, Sharp Facemyer and Ryan Dill each had two steals, while Barringer blocked a shot. Dakota Belcher led Wahama with 17 points and six rebounds, followed by Pauley with 10 points and six boards. Jacob Lloyd and Jacob Warth rounded out the WHS tally with five and four points respectively, with Warth also grabbing six rebounds. Jonathan Frye dished out a game-best four assists for the guests, Lloyd and Pauley both claimed three steals, while Belcher blocked four shots. The season series between these teams finishes tied at one, as the White Falcons won 50-48 on Jan. 15 in Mason. On Friday, the White Falcons host Miller, while the Eagles visit Waterford. https://www.mydailyregister.com/wp-content/uploads/sites/24/2019/02/web1_2.7-EHS-Sharp.jpgEastern senior Sharp Facemyer steals the ball in front of teammate Ryan Dill (right) and Wahama junior Abram Pauley (12), during the Eagles’ 37-36 victory on Tuesday in Tuppers Plains, Ohio. https://www.mydailyregister.com/wp-content/uploads/sites/24/2019/02/web1_2.7-WAH-Frye.jpgWahama senior Jonathan Frye (14) tries a two-pointer over Eastern’s Ryan Dill (20), during the White Falcons’ one-point loss on Tuesday in Tuppers Plains, Ohio.